Functional fitness is of particular importance when working with older adults, since aging is accompanied by a progressive decline in multiple physiological functions, including the ability to perform daily activities. The topic of “functional aging” addresses this ability (or lack thereof) and is becoming more and more relevant, given the increase in people 65 and older and the disability rates in this population. Learn the endocrine system’s pivotal role in aging and how exercise can impact it. It is beyond the scope of this article to go into depth on the endocrine system; however, to better understand the role of hormones in functional aging, it’s important to have some rudimentary knowledge of the connections among the main factors. The summary that follows provides the most relevant highlights. In the brain, two main structures play a role: the hypothalamus and the pituitary gland. “Releasing hormones” from the hypothalamus are sent to the pituitary gland, which in turn sends “stimulating hormones” to other glands—such as the adrenal, thyroid and reproductive organs—to activate the specific hormones required for a desired function. The interplay of the hypothalamus, pituitary and adrenal glands is of particular importance to aging. This interplay is referred to as the hypothalamic-pituitary-adrenal (HPA) axis, and its main function involves stress response (Ferrari et al. 2001; Ebner et al. 2015; Heaney, Phillips & Carroll 2012). The HPA plays a fundamental role in the interactions among the endocrine, nervous and immune systems and is one of the most adaptive systems (Ferrari et al. 2001). When active, it allows the body to respond effectively to challenges and stress, and when inactive, it can lead to stress response overexposure (Ferrari et al. 2001; Vitale, Cesari & Mari 2016). As a person ages, the homeostatic balance and ability of the HPA axis to respond to stimulation is disrupted by changing hormone levels and by the shift in interactions among hormones. This results in chronic glucocorticoid exposure, higher oxidative stress and increased inflammation (Archer et al. 2011). Age-related endocrine changes influence every part of the body in some way, and the changes are not attributable to the actions of a single hormone, but rather to the coaction of many hormones throughout multiple systems (Ebner et al. 2015). The hormones that play a part in functional aging are too many to list, but these are of particular interest: dehydroepiandrosterone (DHEA), cortisol, estrogen, testosterone, growth hormone and insulin-like growth factor type 1. 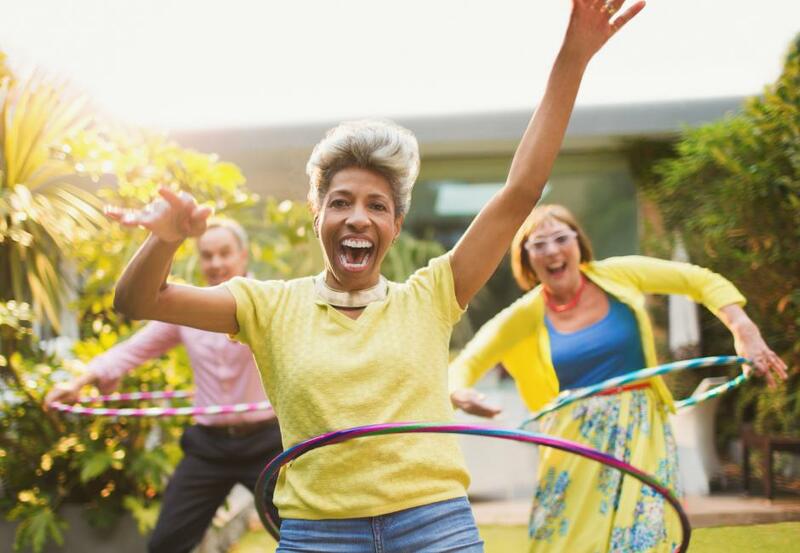 Physical activity can both influence and be influenced by hormones, depending on the type and intensity of activity, as well as the hormone’s function. According to Godfrey & Blazevich (2004), sleep and exercise are the two most powerful nonpharmacological stimuli of GH secretion. Paterson & Warburton (2010) reported that older adults consider the capacity to carry out everyday activities to be of greater concern than disease prevention. With that in mind, fitness professionals working with this niche should focus on increasing functional ability and performance, with an ultimate goal of improving quality of life. The effect that exercise has on hormones can offset some age-related hormonal changes and, therefore, minimize some of the functional decline. Multiple studies show that exercise intensity is a key factor in the hormone response to physical activity among older adults. Godfrey & Blazevich (2004) found that a significant exercise-induced GH response was achieved with high-intensity training (HIT) and heavy resistance training, but only after a certain amount of time. For example, HIT training above lactate threshold resulted in a GH response only after 10 minutes, and sprints were more effective at 30 seconds versus 6 seconds. This same study showed that, in older adults, acute bouts of heavy resistance training resulted in large-scale and immediate increases in testosterone, DHEA and GH and a decrease in cortisol (Godfrey & Blazevich 2004). Low-intensity exercise, in comparison, had no significant GH response in older adults. Although intensity has the highest effect on hormone output, exercise type and specificity also play crucial roles in functional performance and ability. Kim & Ju (2017) found that both resistance training and aerobic exercise had positive effects on GH and estrogen and that both long-term and short-term aerobic exercise could increase estrogen levels in older adults with very low fitness levels. Testosterone levels, however, appeared to be affected more by resistance training. Lovell et al. (2012) found that testosterone levels increased with 16 weeks of resistance training. Regarding functional outcomes, research has shown that using a combined approach of both aerobic and RT results in more positive outcomes (Paterson & Warburton 2010; Heaney, Carroll & Phillips 2013; Gault & Willems 2013; Kim & Ju 2017). For a more comprehensive explanation of hormones and more information about specific types of exercise as it relates to hormones, please see “Functional Aging and Hormone Health” in the online IDEA Library or in the November–December 2018 print edition of IDEA Fitness Journal.If you cannot access the full article and would like to, please contact the IDEA Inspired Service Team at 800-999-4332, ext. 7.